Thousands of people are marching through the streets of London to demand a referendum on the terms of Brexit. Organisers of the People's Vote march have estimated in excess of 100,000 people attended the rally in central London. Lib Dem leader Sir Vince Cable, Green co-leader Caroline Lucas, Labour former NEC member and actor Tony Robinson and pro-EU campaigner Gina Miller were among those who joined the crowd in the capital on the second anniversary of the EU vote. 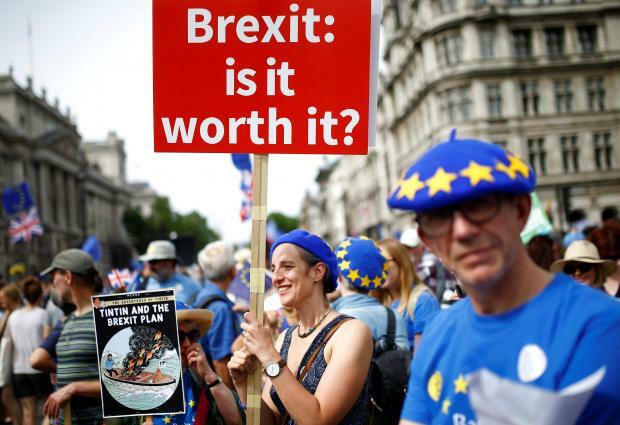 The start of the march was delayed from noon to 1pm, with demonstrators held on Pall Mall ahead of a march to Parliament Square for a rally outside the Palace of Westminster. Matthew Mann, originally from south Gloucestershire, who moved to the Netherlands in 2016 for work, said: "I'm here to show what a European looks like." The IT consultant went on: "I'm married to a French wife, I have two children who are dual national, and we live in Holland and are caught up in this administrative mess. University academic Robert Brady, 62, who works in the computer science department, said: "I have an Italian wife, I work in Cambridge, she works in Rome... I think we're technically what's called 'border workers'." He added he thought a second referendum was "almost inevitable" as "demographically, younger people are in favour, they want jobs, they don't want to sing Elgar".